Esmin Green died on the floor of a Brooklyn ER. 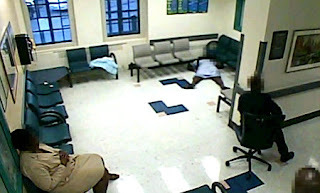 Bob Sharpe, the president of the Florida Council for Community Mental Health, based in Tallahassee, wrote an excellent op-ed in the Tampa Tribune about Esmin Green who died in a Brooklyn, N.Y. emergency room waiting area because no one helped her for 24 hours. Here's the NY Daily News story about it. He also discusses the case of Primrose Jackson, a woman with severe mental illness, who lived for years in a tent outside her mother's home in Miami and went missing in mid-July. These cases beg for media investigations. I hope there are some.